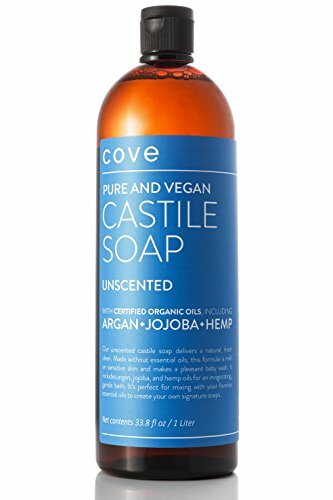 Cove Castile Soap is made with all-natural, vegan, and biodegradable ingredients. We don't use animal fats or byproducts commonly found in other natural soaps. There are no added detergents or foaming agents because these can be harmful to your skin and the environment. Unlike other castile soaps, we don't use palm kernel oil because its cultivation leads to the destruction of our rainforests. Ours is a simpler soap with a smaller ecological footprint. This multi-purpose soap is meant to be diluted. Use it on its own or mix it with other ingredients to make many different personal care and home cleaning products. We've included some recipes on the bottle to get you started. OUR UNSCENTED CASTILE SOAP delivers a natural, fresh clean. Made without essential oils, this formula is mild on sensitive skin and makes a pleasant baby wash.
ONLY CERTIFIED ORGANIC, VEGAN INGREDIENTS. We left out the bad stuff, so there's no detergents, no foaming agents, no chemicals, and no animal products - only pure, fully-biodegradable plant oils transformed into soap. We keep it simple and eco-conscious. WITH ADDED ARGAN, HEMP, AND JOJOBA OILS that are packed full of antioxidants, vitamins, minerals, and omega fatty acids. For good measure, we also threw in olive oil and vegetable glycerin. Together, these ingredients work to repair and illuminate your complexion. IT'S MORE THAN JUST BATH SOAP. You can dilute and mix it to create dozens of personal care and household cleaning products. Use it as a body wash, hand soap, shampoo, face wash, facial cleanser, shaving cream, baby wash, pet shampoo, dish soap, laundry detergent, kitchen and bathroom surface cleaner, bathtub and tile scrub, window cleaner, degreaser, insecticide, antifungal plant spray, and more. Because we've got your back, several of our favorite recipes are included right on the bottle. YOUR SATISFACTION IS IMPORTANT TO US. We meant it when we said that we have your back, so Cove provides a 90-day no questions asked satisfaction guarantee. It doesn't matter where you bought our product. If you don't love it, we will refund your purchase. If you have any questions about this product by Cove, contact us by completing and submitting the form below. If you are looking for a specif part number, please include it with your message.